Just Jingle: The Alley Way Sneak Peeks! Wow! August is just around the corner and we have some super fun new stamps coming at you from The Alley Way! I am excited about the versatility of the sets for this month! Just wait until you see all the fun stuff you can do with them! Here is my first sneak card for you today! Yup. Totally loving the woodgrain panels! That trim is also brand new goodness from May Arts!!! HOLY POM POM LOVE!!!! 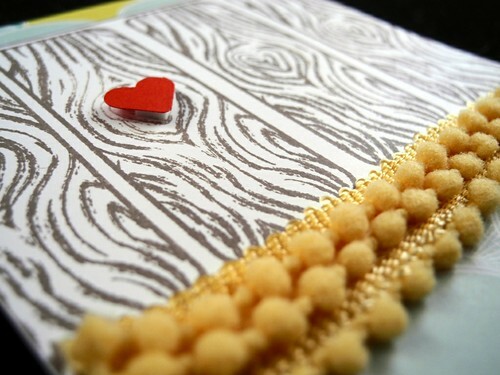 The patterned paper is from Studio Calico. To see more great peeks be sure to check out The Alley Way blog! AWE love the wood grain with the hearts! Cute! Love this card! Those pompoms make me swoon! Love those panels, and that popped out heart! WEll, aren't you just churning out the posts...you win the blogger of the day award!!! 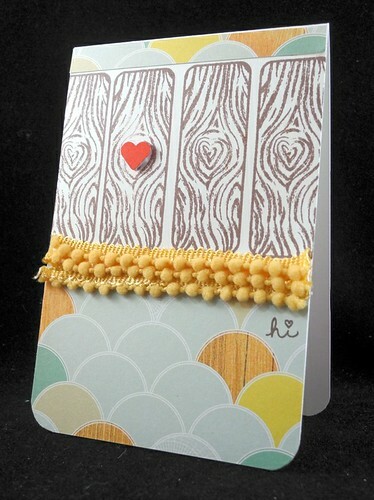 This card is fabulous... love everything about it.. thanks for sharing. Gorgeous! Love the woodgrain panels. LOVE the pom pom trim--this is AWESOME!